MCL-1 is a member of the BCL-2 family of proteins important for blocking apoptosis, or programmed cell death. Many types of cancer cells escape the body's effort to kill them by overexpressing MCL-1. However, new evidence from Vanderbilt University researchers indicates that MCL-1 also helps maintain the identity and ability of stem cells to differentiate, or give rise to other kinds of cells. This capacity of stem cells to become any cell in the body is called pluripotency. Reporting last month in the journal Stem Cell Reports, the researchers found that a form of MCL-1 maintains stem cell pluripotency through its role in the inner matrix of mitochondria, the cell's energy producing "power plants." When this MCL-1 is depleted by an inhibitor, stem cells differentiate. 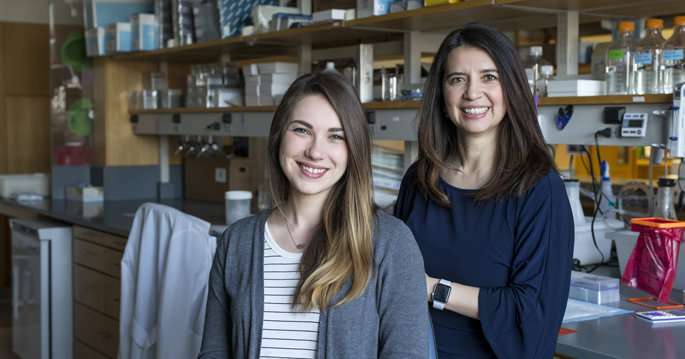 MCL-1 depletion also changes the shape of mitochondria, which are very dynamic organelles, said the paper's corresponding author, Vivian Gama, Ph.D., assistant professor of Cell and Developmental Biology in the School of Medicine. Mitochondria undergo fusion and fission—merging together and breaking apart—depending upon the state of the cell and cell type. Stem cell mitochondria are more fragmented, but when cells differentiate, their mitochondria fuse together and become more elongated to support higher demands for energy. When MCL-1 is depleted in stem cells, their mitochondria fuse, indicating that MCL-1 expression is important for maintaining the normal fragmented state of stem cell mitochondria. Because the proteins that control mitochondrial fusion and fission and the metabolic machinery are all located at the mitochondria, there is potential cross-talk across all of these pathways, Gama said. Independent studies in the Gama lab are directed toward glioblastoma, an often-deadly form of brain cancer. "We would like to learn whether these newly described functions of the BCL-2 family in mitochondrial dynamics can also modulate the survival of cancer stem-like cells," she said. "These are cells in the tumor that are capable of propagating the tumor," Gama explained. "If by blocking MCL-1, you can induce them to differentiate, this would be another way to stop them from dividing."